Enter for a Chance to Win Earrings Inspired by Gwyneth Paltrow’s Oscars Bling: Find Out the Details Here! **UPDATE: The entry period for this giveaway has ended. Pretty as the rose on her sleeve—and with earrings to match! At the 2015 Oscars on Feb. 22, Gwyneth Paltrow worked a pale pink Ralph & Russo dress, complete with an oversized rosebud on her shoulder. 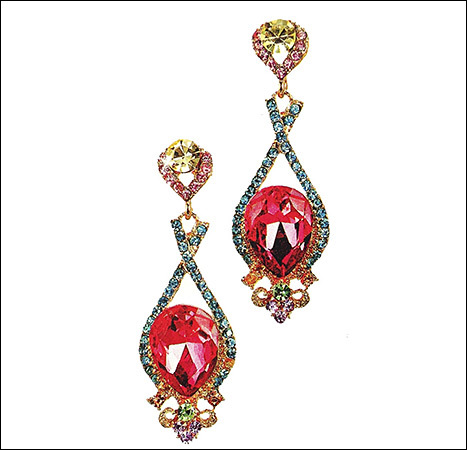 Equally stunning: the actress&apos; complementary Anna Hu "Fire Phoenix" statement danglers, which boasted diamonds, sapphires, tourmalines, and two pear-shaped rubellites. The jaw-dropping pair is reportedly worth a cool $425,000. PHOTOS: Best dressed at the Oscars! You can win these My Jewelry Candy earrings, inspired by Gwyneth Paltrow's 2015 Oscars earrings. Try Goop-worthy accessories for your next big night out with the multicolored My Jewel Candy drop earrings ($42, Myjewelcandy.com). For today, March 20, only, you can enter for a chance to win the look-for-less accessory by clicking this link. NO PURCHASE NECESSARY. Open to legal residents of the 50 United States and Washington DC (EXCLUDING RESIDENTS OF OVERSEAS MILITARY INSTALLATIONS, PUERTO RICO, AND OTHER U.S. TERRITORIES) who as of the time of entry are 18 years of age or older and at least age of majority in state. Sweepstakes is void where prohibited by law. To enter, see the entry pages at usmagazine.com/oscars and follow the entry instructions at each page. Sweepstakes is from 9:00 a.m. EST to 11:59 p.m. EST each day from 3/16/2015 to 3/20/2015. ARV: $42-110. No. of Winners: 5. Certain restrictions may apply. Complete Official Rules are available at usmagazine.com/celebrity-style/page/official-rules-for-the-oscars-2015-accessory-look-for-less-giveaway-sweepstakes. Odds of winning depend upon number of entries received. Sponsor: Us Weekly LLC.